Today, Business to Arts announced an extension of its organisational-capacity programme for Irish arts organisations supported by Bank of America Merrill Lynch and run in partnership with the DeVos Institute of Arts Management at the Kennedy Center, Washington DC. This intensive project, run as part of Business to Arts’ New Stream programme, is currently working with 15 organisations across Ireland, and will be extended to a second year, with the addition of five more organisations, bringing the cohort to 20 arts organisations. Closing date for applications is 24 April 2013. The broader New Stream programme, now in its fourth year and engaging over 170 arts professionals and board members per annum, consists of a number of activities which deliver a range of resilience and sustainability-building resources to arts organisations across Ireland, regardless of size and resource. 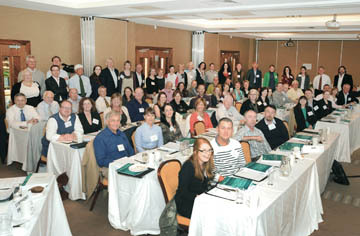 The overall programme is evaluated annually by Business to Arts as part of their reporting of the project and this has found that the organisations which took part in the training have raised over €5 million in new income over three years, through applying the techniques directly acquired on the programme. This €5.4 million of funds raised is against a total of €400,000 invested by Bank of America Merrill Lynch through the Bank of America Charitable Foundation and €70,000 invested by the Department of Arts, Heritage and the Gaeltacht. Business to Arts works to support sustainability in the cultural sector through partnership and professional development. The organisation is funded by support from the business community, foundations, arts organisations and the public sector, all of whom share a belief that collaboration between stakeholders can help enhance creativity and deliver a benefit to society. Business to Arts and the Kennedy Center have opened the application process for the second intake of organisations. The application form and further information is available on www.devosireland.org, and the closing date is 22 April 2013. 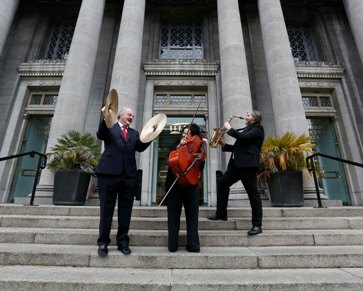 Brendan Murphy (left), Allianz CEO, Una Ni Chanainn, RTE NSOand Stuart McLaughlin,CEO of Business to ArtsÂ at the National Concert Hall. Nominations for the Allianz Business to Arts Awards 2013 opened officially in March. The awards in their 22nd year (the 12th year of Allianz’s support) seek to recognise and celebrate the creativity and mutual benefits of close collaboration between the business and artistic community. The Allianz Business to Arts Awards recognise businesses, artists and arts organisations that develop creative partnerships, working together on sponsorships, mentoring, training, staff development, commissioning, CSR projects and so on. This year will mark Allianz’s 12th anniversary of its involvement in the Business to Arts awards which has seen Allianz build on over two decades of support programmes for Irish arts and sports communities. As public funding faces further pressures, Allianz is encouraging more leaders in the business community to look to the creative sector to achieve business advantage, and to learn from the achievements of the Awards alumni who achieved mutually beneficial relationships with the arts communities. Both Allianz and Business to Arts believe that culture plays an important role in creating a healthy society and a strong community in which to do business. Over 25 years, Business to Arts have championed the creation of structures to support the Irish arts sector, given its central role in the development of Ireland’s national character and its international profile. Closing date for applications is Thursday May 2nd 2013. Go to http://www.businesstoarts.ie/awards for information on the application process and to download and application form.